I am extremely happy to see this day! Crazy week and I just plan on relaxing after I do some running around town to complete some last minute stamp camp stuff for tomorrow’s World Card Making Day event. Friday also means it is time for Beate’s wsc. #60 that is! With very limited time this week, I’m keepin’ it simple today and showing you a card that is fairly quick but I think has some cute little details. I attached the Hodgepodge Hardware oval frame with ribbon and added some silver coordinating brads for balance. I love how the ribbon is Kiwi Kiss on one side and Very Vanilla on the reverse side…now that’s coordination:) I re-stamped the flower image again in Baja Breeze ink, cut out, and adhered to some of the flowers just to add a little dimension to the main focal point. If you eliminate that step, this is a 10 minute card. CARDSTOCK: Baja Breeze, Pacific Point, Very Vanilla; Muirfield Designer Series Paper. INKS: Kiwi Kiss, Baja Breeze, and Pacific Point Classic Stampin’ Pads. ACCESSORIES: Kiwi Kiss/Very Vanilla Satin Ribbon; Styled Silver Hodgepodge Hardware; Linen Thread. Thanks for stopping by and have a happy weekend. MJ, this is gorgeous! I love the ribbon, the hardware. . .these colors make me happy! Take a deep breath, my friend, and enjoy the weekend! Wow! Love it! Love how you popped the flower buds, love the brads and the ribbon and the sentiment placement and framing. Awesome. This is beautiful! Love your colors, the ribbon the popped up flower! Gorgeous! Happy Card Making Day! This is so pretty! The way you attached the hardware with the ribbon is cool! Mary Jo, this is absolutely gorgeous! LOVE the colors! Have a relaxing weekend friend! Absolutely GORGEOUS!!! You can even make “simple” look spectacular!! It would have taken me half of the day to achieve this!!! I hope your weekend is a relaxing one!! 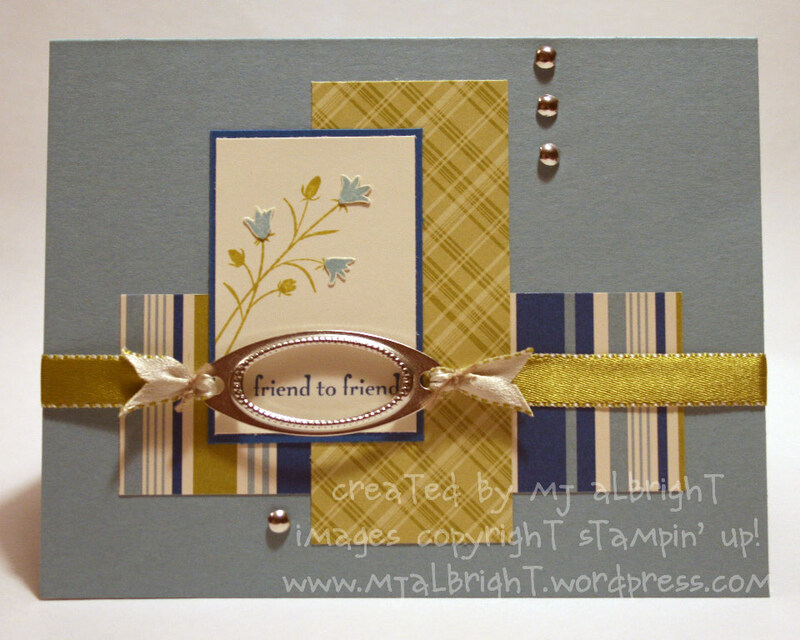 Love the soft colors in your card – thanks for sharing! Awesome!! I like the way you attached the hardware with the ribbon. I’ve been wondering about that, and have been to affraid to try it. Thanks for showing me it will work AND look good! Beautiful composition, MaryJo — these colors are wonderful and all the silver accents keep your eye moving . . . such a pleasure to view! This is awesome! I have everything you used (minus the Hodgepodge hardware) and I would never have come up with this. I love how you attached the ribbon. I wasn’t quite sure until I enlarged the photo. Excellent! LOVE this! The hodgpodge is THE perfect touch. You always nail that perfect touch part. 😉 Have a wonderful weekend MJ!! Wonderful card, Mary Jo! Love the designer paper, colors, HPH, and ribbon treatment! Love it! The ribbon is perfect with the hardware. I love where you placed the brads to add more interest. And, of course, the DSP is awesome! Lovely, the dimension in the flowers is so neat and like how you tied the hardware on with ribbon, such pretty colors! Amazing, Mary Jo!! Your ribbon and hardware treatment is flawless!! Love the dimension on the stamped image, too!! Wow, this really is pretty … simple but yet very eyecatching. The colours are great and love the way you tied the ribbon! Also, good luck with you the meeting … I’m sure you will be a fantastic speaker! Very elegant. Love the papers you used! Absolutley gorgeous Mary jo! I love the minimalist look, you really did well with this sketch!